City Council Races Beg the Question: When is a Democrat Not a Democrat? 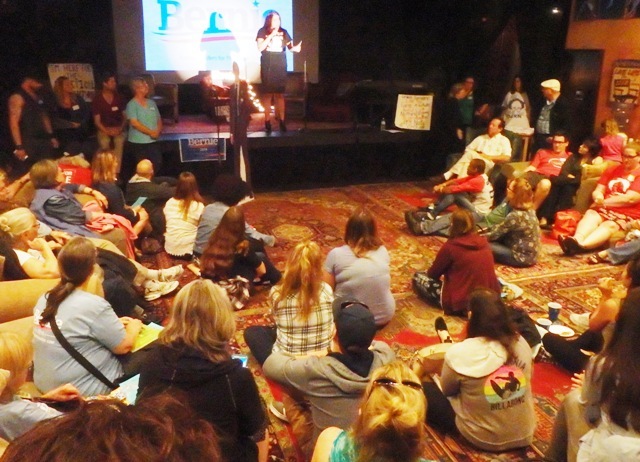 Bernie supporters “barnstorm” in Ocean Beach. Are there candidates running for City Council in Districts 3 and 9 supported by interests with a history of backing Republicans really Democrats? Do campaign donations define a public official? Is Bernie Sanders a Democrat? Is Hillary Clinton just a Republican in drag? How about Congressman Scott Peters after his votes on refugees and trade? Are people who used to be Republicans ever to be trusted? Where do you draw the line? There are things you hear in political circles better off left unsaid in public places. We’re all human, after all, mistakes get made, and things get said that people regret. Then Bob Filner came along and people raised lots of questions about the propriety of keeping dirty laundry private. On the left side of the aisle in San Diego, the after-effects of winning big in 2012 and crashing just months later linger on throughout the various interest groups that make up with the Democratic party. The party is no monolith; it’s more like the seeds of a dandelion, together at the moment but ready to scatter in a million directions with a the next breeze. The latest adjuncts to the party are the newly energized legions of Sanders supporters, who are suspicious of anything connected to the traditional party organization. Reddit and other social media have tales aplenty–and scant proof– about infiltrators and agent provocateurs supposedly dispatched from the Hillary wing of the party. Democratic Party regulars wonder if those ‘feeling the Bern’ can be trusted to support campaigns beyond the primaries? What about the down-ballot contests critical towards making a progressive agenda possible? As righteous a candidate as Senator sanders is (and I like him a lot), I haven’t seen any evidence that he’s capable of implementing policy via a magic wand. Labor leader Mickey Kasparian and Assemblywoman Lorena Gonzalez, once leaders of opposing camps on the Democratic side in the special election to replace Filner, may be reconciled (judging from their social media posts), but many of the foot soldiers and field commanders in that battle continue to harbor bitterness left over from four years ago. Will the party be united come November to take advantage of the opportunity of a lifetime Republicans are offering up via the chaos of their presidential selection process? Recent polling for the Democracy Corps and the Women’s Voices Women Vote Action Fund* shows the country edging toward an electoral earthquake in November. The Republican brand is seriously damaged. Democrats have a 6 point lead in named congressional votes. Responding to the nationalist economic message of the Trump campaign with a ‘level the playing field’ message in the general election campaign attracts both disenchanted swing and progressive voters in large numbers. And that’s before factoring in women and minority voters angered by the misogyny and racism on the GOP side. Part of what’s going on is normal primary politics. In some areas, the Democrats have some tough choices to make. Take District 9, for instance. All the candidates in the City Council race are Latino, including the less-well-known Araceli Martinez. D9 council candidate Ricardo Flores was endorsed by retiring City Councilwoman Marti Emerald and many of her supporters fell into line behind him. He comes from a family with a history of activism in Latino causes, and is the only lifelong Democrat among the major candidates. D9’s Sarah Saez did some cutting edge organizing with immigrant taxi drivers, making her popular with forward-thinking organized labor and the East African community. She initially considered the idea of running as an independent socialist, ala Kshama Sawant of Seattle. D9’s Georgette Gomez has done some groundbreaking grassroots organizing in challenged communities around environmental issues. She’s also been active in the LGBTQ community and has identified with the Green Party in the past. All three candidates have some supporters in organized labor, a traditional source of funding for Democratic candidates. Fast Fact: Organized labor is not a monolith, despite all the conspiracy-mongering of the right. Is there a way to divine the best candidate? I’ve met with Gomez, Saez, and Flores over the past month, and been supportive of causes all three were involved in. Listening to what each of them says on the stump, their differences are hard to grasp. Where Do Good Candidates Come From? It’s only when you start looking at the money that things become clearer. Gomez has support from many traditional Democratic party supporters, some of whom have also donated to the other candidates in this race. Saez has less funding, but she has the Labor Council’s blessing and they’ve been occupied with other matters lately. They’ll be there when it counts; Mickey Kasparian doesn’t make empty promises. Flores, in addition to the names I saw on the other reports, has maximum donations from three dozen donors I usually associate with Republican candidates. He also has raised the most money by far. Flores told me not long ago that Marti Emerald had supplied him with a list of people to get him started. Now, Ricardo Flores certainly didn’t talk like Republican when we sat down in a neighborhood park a few weeks ago. The guy was nice as pie talking to somebody (me) with a radical bent. He talked a lot about nuts and bolts stuff and seemed aware of social issues and their importance to the district. Moreover, he emphasized his identity as a Democrat. Then I got word late last week that the regional Chamber of Commerce types, who (along with the Lincoln Club) have Political Action Committees running for D1’s GOP candidate Ray Ellis and Mayor Kevin Faulconer, have created a PAC for Ricardo called Urban Neighborhoods for Ricardo Flores. These are people with a history of supporting causes antithetical to traditional Democratic values. This is not a good thing if District 9 (which is heavily blue) thinks they’re voting for a Democrat. Let’s switch over to the City Council Race in District 3 (a very Democratic district with very high voter turnout) for comparison. Councilman Todd Gloria is termed out and, having passed on running for mayor, is seeking Toni Atkin’s Assembly seat. Anthony Bernal, a staffer for Gloria, and Chris Ward, chief of staff for state Sen. Marty Block, are vying to replace him. As is true in the D9 contest, the major candidates claim to be Democrats. I’d heard rumblings a while back that certain conservative donors were donating to Bernal in the hope of drawing funding away for Democratic D1 candidate Barbara Bry. The race for the seat in District 1 is considered to be the key to shifting the balance of power towards Republicans on the city council. The thinking was, according to my source, any money spent in D3 wouldn’t be available to support Bry’s candidacy. Jess Durfee, the county party’s chair emeritus, looked through the donation histories of Bernal’s donors and found a number of them had been substantial contributors to the Republican National Committee, a handful of Republican presidential campaigns and conservative local groups like the Lincoln Club. 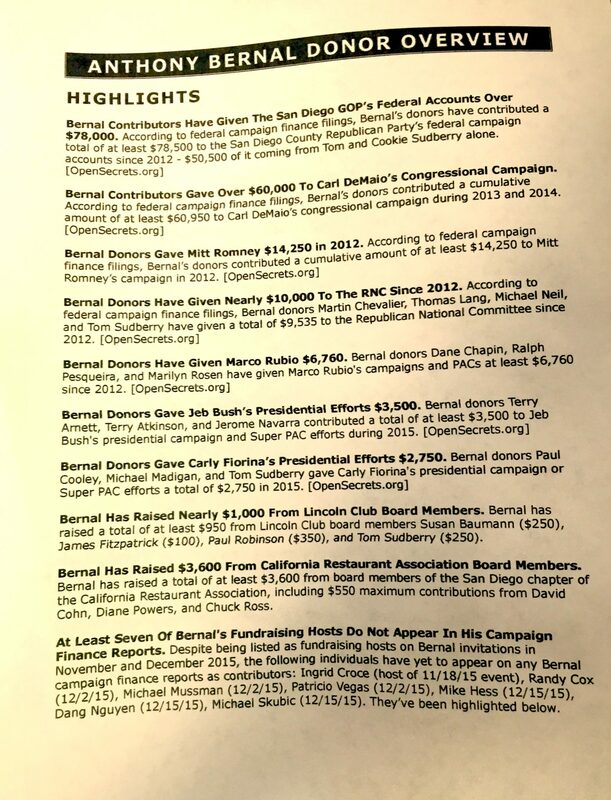 In all, nearly $10,000 of the roughly $100,000 Bernal has raised so far came from people with a history of donating to Republican candidates and causes, according to Durfee’s memo. Bernal would have the resources to wage a negative campaign against Ward unless progressives stepped up their financial support for him, Durfee wrote. The group unanimously voted to recommended the party endorse Ward next week. Typically when there’s stealth support for a candidate through regular donor channels, most of the funny money comes in late enough in the race so it can’t be effectively used as an election issue. And it turns out that Bernal’s support from typically center-right donors is even higher than Durfee estimated. The one area where Bernal differs from both Councilman Todd Gloria and contender Chris Ward has to do with the minimum wage. He’s for an increase, sorta. Just not so soon. Or something like that. Then there’s the joint fundraiser sponsored by local builders featuring both Bernal and Republican D1 candidate Ray Ellis. A subplot to watch for here will be whether the Chamber of Commerce decides to fund an opposition campaign opposing the local minimum wage/earned sick days referendum. Now that the issue is resolved on the statewide level, it’s entirely possible we’ll see a revitalization of the Small Business Coalition. One of the state’s most influential labor organizations has sent a not-so-subtle message to some of the Democrats often seen as aligned with business interests: We’re not backing your reelection. …While it’s unclear to what extent the non-endorsements will impact the June and November campaigns, at the very least it’s a symbolic show of disapproval. Labor and environmental groups have been critical of some of the ‘Mods’ during key legislative battles this year and last. So Who is a Democrat? People can become Democrats by simply checking a box on the voter registration form. There’s no oath. No principles to study. The party infrastructure is largely made up of people who–drum roll, please–just show up. Like organized religion, the leaders often fail us, as long-time activist Martha Sullivan has been known to say. This year’s Democratic primary campaign, more than any I can remember, has resulted in a lot of discourse on the question of just what does the party of Franklin D. Roosevelt stand for? We can thank the dichotomy between Bernie Sanders and Hillary Clinton for some of this self-examination, but the reality goes way deeper. Conditions change and, along with them, perceptions, rhetoric. and policies. People do change. Nothing pisses me off more than to see some BernieBot going nuts on social media about how Hillary Clinton’s support of Goldwater in 1964 somehow makes her evil. Or some HillHugger claiming Sanders is a misogynist because he wrote something back in the sexual freedom era. Hell, we were all crazy then. Let’s wait fifty years and take a look at these finger-pointing folks for their ideological purity. These often juvenile discussions also mask the reality that the Democratic party is more united at this point than it was eight years ago. As I far as I’m concerned, there are two overarching things that should define Democrats: history and a sense of humanity. The Democratic Party has long home to those who have long argued for the right of individuals to be respected for their work and not put into conditions that are harmful to them. Organized labor wouldn’t be where it is (for better or worse) without the Democratic Party and vice versa. Those who would deny the importance of this symbiotic relationship do so at great peril to any agenda they would seek to advance. The trade deals of the past few decades omitted accommodations to those displaced by the economic disruptions they caused and are –true or not– now symbolic of the widening inequality in this country. Over the past four decades, Frank argues in his new book “Listen, Liberal,” the Democrats have embraced a new favorite constituency: the professional class — the doctors, lawyers, engineers, programmers, entrepreneurs, artists, writers, financiers and other so-called creatives whose fetish for academic credentials and technological innovation has infected the party of the working class. Obama, like Bill Clinton before him, is a member in excellent standing of this class and a natural protector of it. “When the left party in a system severs its bonds to working people — when it dedicates itself to the concerns of a particular slice of high-achieving affluent people — issues of work and income inequality will inevitably fade from its list of concerns,” Frank concludes. Finally, we humans are facing a world where “every man for himself” is soon to be a fatal idea. The laissez-faire fantasies of the (Ron) Paulistas and their ilk have no place in a world needing cooperation more than competition to deal with the future. By a ‘sense of humanity’ I mean we’re all in this together and therefore, the pride and prejudices of the past must be put aside. Growing economic inequality is a sign of societal failure and the market forces that reactionaries see as a solution are, in fact, the cause. I’ll have more to say on these subjects in future columns. A tip of the hat to local activists who showed up to greet Senator Ted Cruz on Monday night. republican-esque pandering to the wall street banksters by the clinton’s have done more damage to the country than probably any other administration in history: reigel-neal, banking modernization, gramm / leach / bliley, nafta, pntr, etc, etc. the sell out has made them rich – able to command six-figure per hour speaking fees – congratulations. secret speeches – wonder why?